Seven SIU women’s swimmers and divers took a swim this weekend, but it was slightly colder than they are used to. Sophomore swimmer Lauren Stockton started a team, which jumped into Campus Lake on Saturday morning in the name of charity. Donning their SIU bathing suits and swim caps, despite sub-freezing temperatures, the swimmers took on the Polar Plunge to support Special Olympics of Illinois. Stockton has participated in the event before. Freshman swimmer Mikaela Montgomery compared the plunge to an ice bath. Sophomore swimmer Sarah James was on board with the idea when she saw Stockton and sophomore Riley Schroedter take the plunge in 2014. James, who has friends with relatives who deal with mental disabilities, said the Special Olympics is a great cause because it enables those with special needs to participate in sporting events that people without disabilities do not really have to think about. Stockton said she was proud of her group. 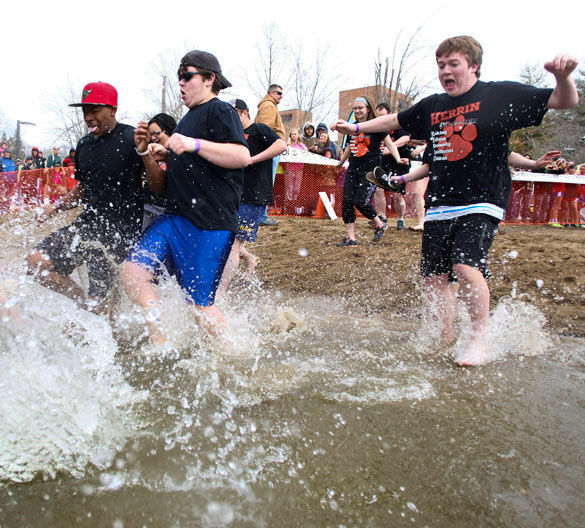 The Polar Plunge raised $54,235, compared to $55,000 last year, Melzer said. This included online donations, as well as the cash and checks paid the morning of the event. The team raised $1,365, compared to $300 last year when it was just Stockton and Schroedter. All of the proceeds go to Special Olympics. The goal of next year’s event is to get the rest of the team involved, including coach Rick Walker and diving coach Joy Zhao. Plant Services and Operations made the event possible. It provided backhoes, axes and the manual labor needed to cut the ice at about 3 p.m. Friday. The lake refroze to about 1-inch thick by Saturday morning. Paul Melzer, the event organizer and Special Olympics Area 15 director, said the re-clearing of the lake’s ice shelf started at about 9 a.m. Saturday. Sledgehammers and axes were used for the second part of the excavation, while Rend Lake search and rescue divers were on hand. The Polar Plunge, a volunteer-driven organization, had more than 1,600 active volunteers at the event. “It provides funding and support for those athletes in the  events we’re running on a year-round basis,” Melzer said. With their competing season over, the Salukis participated for the bonding experience. “Instead of just writing the checks or collecting the donations, we get to come out and do something as a team together,” Stockton said. Freshman diver Rachel Williams said it was something she will remember. “I’m wondering how fast I’m going to be able to get out of the lake and get a blanket around me,” Williams said before the event. Freshman swimmer Penny Bowser, who has worked as an assistant swim coach in the past with people who have special needs, said the plunge was a good reason to get other people to recognize the cause. New to the yearly event was the Law Enforcement Torch Run Donut Dash 5K, which was set up by the SIU Police Department. The dash deducted a minute from the runner’s final time for every donut eaten along the route. It raised $4,550. After three years organizing the plunge on campus, Melzer said his job is something he would not trade for anything in the world. “To see the progress that they make and to see the difference that our programs make, it’s unbelievable,” Melzer said.